Chapters and enhanced podcasts provide an opportunity to make a podcast more interactive as well as create bookmarks that a listener can use to advance to specific sections of your recordings. Since 2005 Chapters have been available in various podcast applications with minimal success. An understanding how they are used is important to determine if it is worth your time to add chapters to your podcasts. What are Chapters in a podcast? Chapters in podcasts, also referred to as enhanced podcasts, are audio media files that include additional images, titles and web links within specific time positions or segments of the recording. Some players will display images and/or web links when playback is within the specified segments. Some players display the chapters as a way to jump to specific sections. Both have advantages and disadvantages. Chapters and enhanced podcasts are not very effective in podcasting — here’s why. Ever heard the saying “It’s like watching paint dry?” That’s essentially what you are asking someone listening to your podcast to do when adding chapter links and images. Most listeners who consume podcasts do so in situations that do not permit them to watch or interact with their devices, such as driving, jogging or while at work. Chapters, when used as a way to jump to specific segments in your episodes, can be useful but are problematic depending on the player. Currently, chapters as a means to jump to specific segments works on the official iOS Podcast app by Apple as well as iTunes desktop. Web-based players do not have native support for chapters. Chapter images are not supported by some chapter enabled players. The official iOS Podcast app by Apple does not display chapter images. Web links in chapters are only effective if the recording refers to them during playback. A web link that appears between minutes 2:30 and 3:30 requires the user to know to look at their device during that time of play. If your podcast does not mention in the audio to view the chapter information to click the link, the listener will more than likely never know the link was there. The creation of chapter based enhanced podcasts needs to be well thought out before recording to reference the marks during playback. In your recording, you might want to reference the chapter title, but be careful not to refer to the chapter time as that may change during editing. You may need to educate your audience every time you mention a chapter, as well as disclose that the option might not be available depending on the player they are using. The biggest factor which makes enhanced podcasts less effective is how podcasts today are consumed. 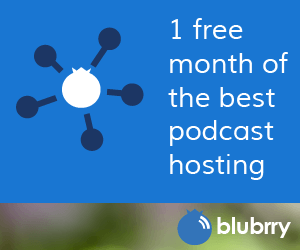 Based on studies from podcast companies like Blubrry as well as ratings companies such as Nielson, podcasts for the most part are consumed in a car, at work, working out, walking, or at home while doing something else. These are all situations where the listener clicks play then sets their device down to enjoy the podcast while doing something else. If you have images you wish to incorporate into your podcast you may want to consider creating a video podcast instead of an enhanced audio podcast. If you want to incorporate web links, you might be better off including such links within your podcast show notes. Chapter marks are ideal if you want to provide an easy way for your listeners to skip to specific segments of your episodes. To make this method effective, you must educate your audience that the options to skip segments exist. You will also need to explain which applications are supported and how to use them. A simple How to listen page on your podcast website and constant referencing of this page in your podcast should suffice. Avoid using chapters as a way to make your content interactive during playback. Adding images and web links will not be effective due to the limited player support. Do not forget how most listeners consume audio podcasts, they are not watching the device while they listen to your podcast in most cases. Using chapter marks as a way to jump to specific segments of your podcast can be effective, but consider that if you are using these tools to split different types of audiences, you may be better served creating separate podcasts. Remember to be realistic about how complex you want to make your podcast episodes. Though the listener will not care how much time you put into each episode, you may end up burning yourself out for a feature that does not provide a significant benefit to your listeners. You can no longer create enhanced podcasts with GarageBand. Apple discontinued chapter marks in GarageBand 10, released in October 2013. GarageBand versions 4, 5 and 6 include chapter tools to insert images with web links to m4a audio files. Auphonic online service can add chapter marks including links, titles and images to mp3, m4a, ogg and opus audio files. Podcast Chapters for OS X 10.10 or later can add chapter marks to mp3 audio files. MP4Box command line tool can add chapter marks to m4a audio files. Podreel for Windows can add chapter marks including links, titles and images to m4a audio files.